The Intradisciplinary Lecture series presents a free, public conversation about guns between Tom Sachs, a sculptor, and Tom Healy, a writer. Charles Lewis Tiffany was the proprietor of a stationery store and gift shop that opened in Brooklyn in 1837. It was the first store in New York City to list prices on each item. During the Civil War, Tiffany supplied swords to the Union Army. Beginning in the late 1800’s, Tiffany created a series of luxury handguns for the nation’s leading firearms manufacturers, Colt, Winchester and Smith and Wesson. They abruptly canceled the series in 1911 when New York City adopted its first gun control law. 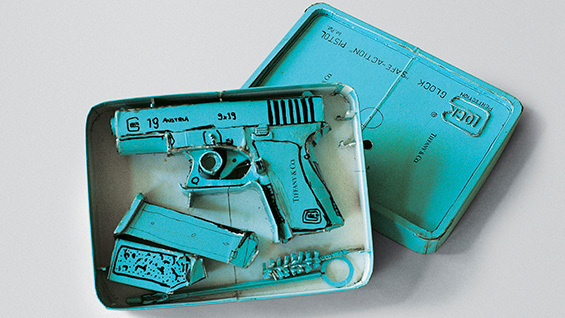 Seven Tiffany handguns are in the collection of the Met. Pierre Terjanian, head of the Arms and Armor department at the Met, says, "So far as we know, the guns never killed anybody." Gaston Glock is an engineer and business executive. He manufactured curtain rods and knives for the Austrian army. In 1981, when he was 52 years old, Glock patented the first polymer handgun, the Glock 17. The Glock is now the best-selling handgun in the world. In 1999, a hired assassin made an attempt on Glock’s life. His weapon was a wooden mallet. Glock survived. Tiffany has not created a series of Glocks. But Tom Sachs has. Tom Sachs (b. 1966, New York) is a New York-based sculptor known for his work inspired by icons of modernism and design. Using modest studio materials, Sachs creates parallel universes incorporating semi-functional sculpture, sometimes deployed by the artist and his studio assistants for interactive projects, as in Nutsy’s (2001-3) and Space Program (2007, 2012, 2016-17). His work is in the collections of the Museum of Modern Art, New York; the Metropolitan Museum of Art, New York; the Solomon R. Guggenheim Museum, New York; the J. Paul Getty Museum, Los Angeles; and the Centre Georges Pompidou, Paris, among many others. He has had solo exhibitions at Yerba Buena Center for the Arts, San Francisco (2016-17), Noguchi Museum, New York (2016), the Brooklyn Museum, New York (2016), the Contemporary Austin, Texas (2015), the Park Avenue Armory, New York (2012), Fondazione Prada, Milan (2006), and the Deutsche Guggenheim, Berlin (2003), among others. His film A Space Program was released by Zeitgeist in 2016, offering viewers a glimpse into the artist’s studio practice, philosophy, and the narrative surrounding his 2012 project with Creative Time at the Park Avenue Armory. Tom Healy is a writer. His third book of poems, “Velvet” has just been published by Monk Books. Healy gave Tom Sachs his first gallery show in 1994 when Healy opened one of the first three galleries in Chelsea. Guns were fired and sold at Sachs’s show.